Last week, my friend and colleague Bill Fink passed away. He was 46 years old. A few months ago, Bill went to the hospital complaining of a severe pain in his side. He was fearful it was a gall bladder problem but it turned out to be much worse. Bill was diagnosed with stage 4 cancer in his pancreas. The outlook was bleak and his chance of recovery was small, but he underwent treatment anyway. The treatment did not work. In September, Bill was placed in hospice care. All treatment was stopped and his caregivers focused only on managing the pain that inevitably comes with this disease. On December 16, Bill succumbed to the cancer. He weighed about 120 pounds at the time of his death. Bill and I were both Technical Evangelists on the same team at Microsoft. He joined the company in late 2014 - about a month after I did. A few years ago, we both worked for the small consulting company GA Sullivan. We never met during this time because he lived near St. Louis and I lived near Cincinnati, but we shared many common friends and acquaintances. We finally met when we shared a room at a team off-site in Scottsdale, AZ in early 2014. I found Bill, intelligent and easygoing and funny and silly and very passionate about technology. Bill loved tinkering with hardware and writing software. Earlier this year, he missed his flight home from Seattle because he was so engrossed in writing software for a Hololens. One of his most impressive projects was a photo booth application that used the depth sensing technology in a Microsoft Kinect device instead of a green screen to replace the backgrounds in photographs. Bill loved being a Technical Evangelist and he wrote about that last December after a year on the job. Bill spent much of his life and his career helping others. Whatever knowledge he had, he was always happy to share it with others. I have encountered many people who learned from Bill’s teachings. I was lucky. I had a chance to spend some time with Bill these past few months. I visited him 4 times since Labor Day and we spoke on the phone between visits. Because our team is so spread out geographically, it was difficult for most colleagues to travel often to St. Louis. I was only a 6 hour drive away, so it fell to me to keep everyone updated on his status. Some people have asked if this made it more difficult to deal with Bill's death; but for me, connecting with him at the end, has made it easier for me to deal with his death. We had a chance to talk and I had a chance to say goodbye. And I had a chance to see the best in him. Bill faced his illness with great courage and grace. He never denied its seriousness and he was not afraid to talk about it. But I never heard him complain about the hand he was dealt. Even in death, Bill is making an impact on the technology world. Bill’s brother wrote an obituary that described Bill’s demise using computer terminology, such as "...encountered an unhandled exception in his core operating system, which prematurely triggered a critical ‘STOP’ condition" and "Bill’s application has been migrated to the Cloud". The obituary began to trend on Reddit and many newspapers, including the Chicago Tribune, the Miami Herald, and the Washington Post, wrote about it. I will miss Bill's humor and his passion but I will carry part of him with me until I encounter a critical 'STOP' condition and my applications are migrated to the cloud. I hope I do so with courage that Bill Fink showed. If you would like to make a donation to help Bill's family, you can do so at https://www.gofundme.com/BillFink. Last night, I attended a Founder Institute session for the first time. I was invited to tell members about the BizSpark program, but I stuck around after my presentation was done. Founder Institute is an organization designed to assist people start a new company - helping them through every aspect of the startup process. At last night's meeting, members practiced pitching their startup idea to potential investors. Three experienced entrepreneurs listened to each 3-minute pitch and provided feedback on the presentation. It was good practice for the startup and it was educational for me. Identify this early in your presentation. Why do customers need your product or service? Who will potentially buy it? Investors are unlikely to have heard your idea before. Make it easy for them by comparing it to things with which they are familiar. If your sales model uses contract salespeople who reach out to individual consumers, compare it to Avon. One startup proposed providing practical tests for companies hiring electrical engineers. Remind the audience that similar tests are now used successfully by companies hiring software engineers. Not everyone is a potential customer. Identify what you are selling and who will buy it. If this is an established market, what are the current revenues - both worldwide and in your local area. One startup mentioned that the current market was in the trillions, but provided no context for that number, making it difficult to digest such a large number. Filter those customers to those who might reasonably consider your product and define who those customers are and how much they spend. One hopeful startup was planning to sell wedding dresses online. At the end of his presentation, he casually mentioned that he owned a store that sells wedding dresses. Each of the panelists told him to lead with that information as it established his credibility. He was already familiar with the marketplace and the potential customers. In his case, it was even more important to establish this credibility because he is a man and his target audience is mostly female. Startup pitches tend to be short (each pitch last night was limited to 3 minutes), so focus on the things that will make your startup successful. It doesn't help to list dozens of features your product will eventually have. It does help to list those features you plan to include in the first release of your product and why those features will resonate with potential users. In my job as a Technical Evangelist, I work with many startups, often providing mentoring to them. Listening to experienced entrepreneurs last night will help me to serve as a better mentor in the future. A couple years ago, J Tower and his team noticed attendance at the Grand Rapids .NET User dwindling. This trend was in stark contrast to the annual GR DevDay conference that attracted hundreds of attendees each year. Tower came up with a novel approach - he discarded the idea of a monthly user group meeting and replaced it with a quarterly meeting that more resembled a conference than a user group. Because the quarterly meeting took place on a weekday evening and was patterned after GR DevDay, he dubbed it "GR DevNight." Each GR DevNight begins with a keynote presentation delivered in front of all attendees. After the keynote, attendees can choose from among 3 different presentations - each lasting about an hour. Each GR DevNight is assigned a theme and all presentations relate to that theme. At this week's meeting, the theme was Cloud Computing and I was excited to deliver the keynote address. I showed off many of the Open Source and non-Microsoft technologies supported by Microsoft Azure in a presentation titled "Microsoft Azure Without Microsoft." While driving from Detroit to Grand Rapids, J called me to tell me that a medical emergency forced a late cancellation by one of the speakers that evening. He asked if I could deliver a breakout session in addition to the keynote. I had been working on a presentation about Azure Mobile Apps so I offered to premiere it that evening. It was an excellent event. A hundred attendees packed into a room at Cornerstone University to hear the keynote and they split pretty evenly between the three breakout sessions. If you run a user group that is struggling to maintain interest month in and month out, a model similar to this might help you to revitalize your group as it did for the the group in Grand Rapids. I recently interviewed Wunderflats CEO Jan Hase for DevRadio. Wunderflats is an online service allowing users to search for furnished apartments. -Watching the Big10 Championship Game in Indianapolis with college friends last night. -A chance to see Nick's team play at Northwestern yesterday afternoon. Today I am grateful for a walk around downtown Chicago yesterday with Nick​. Today I am grateful to see Nick and his new team in Milwaukee yesterday. Today I am grateful that someone found my ID card that has been lost for weeks. Today I am grateful for dinner in northern Kentucky last night with David, Sue, and Debora. -The hospitality and generosity of Sherree and Doug. -A week with my family in Michigan. Today I am grateful for a day in East Lansing seeing old friends and watching the Spartans dominate. Today I am grateful for yesterday afternoon with my mother. -Thanksgiving dinner with all my siblings, their spouses, and their kids. Today I am grateful for an afternoon at the Art Institute of Chicago. Today I am grateful for a double cheeseburger (cheezborger cheezborger), a coke (no Pepsi), and chips (no fries) at the Billy Goat Tavern yesterday. Today I am grateful for an afternoon exploring Chicago neighborhoods with Dan. -A very funny show at Second City last night. Today I am grateful for a snowy evening with Kate. Today I am grateful for a chance to teach a workshop in Evanston last night and students who are eager to learn. 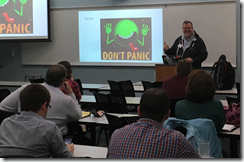 -My first time speaking at the Chicago .NET User Group in Downers Grove. Today I am grateful to watch the Champions Classic basketball games (MSU defeated Kansas; Kentucky defeated Duke) at the United Center last night. Today I am grateful that I finally got my car repaired. It has been randomly stalling for months. 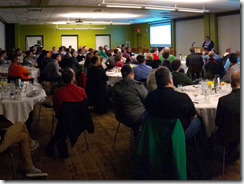 -A chance to deliver the keynote presentation at Detroit Dev Day yesterday morning. -Dinner with Jay and J. last night. Today I am grateful to the organizers and volunteers of the St. Louis Day of .NET - great conference! Today I am grateful to meet up with old friends. Today I am grateful to all this nation's veterans, especially my Dad. Today I am grateful for the energy I gather from the local startup community. Today I am grateful that much of my job is stuff that I would be doing anyway. Today I am grateful for a chance to edit months worth of photographs yesterday. Today I am grateful to turn off my alarm and pay off some sleep debt last night. Today I am grateful that the back pain I experienced yesterday is almost completely gone this morning. Today I am grateful for a few days in San Francisco - one of the great cities of the US. -Watching the Warriors - Grizzlies game live in Oakland last night.